This unit is NEW, COMPLETE, packed and sealed by Whistler. It is priced to sell so do not miss out. Please read below for features. Any questions please don't hesitate to contact me. I will get back to you as soon as possible. The Whistler TRX-1 is multi-system adaptive digital trunking scanners with Motorola P25 Phase I, X2-TDMA, Phase II and DMR making it capable of monitoring the following unencrypted channels/systems: Conventional DMR Entered as a DMR trunked system, Hytera XPT, MotoTRBO Capacity Plus, MotoTRBO Connect Plus, and MotoTRBO Linked Cap Plus systems. The TRX-1 allows the user the ability to group their stored objects using up to 200 Scanlists plus a special Skywarn scanlist. Record received audio from selected objects and searches to the Micro SD card. Replay recorded audio using powerful built-in playback system or transfer to PC for playback and archiving. Record up to 50 hours of audio on the 2 GB microSDr Date and time stamp recorded audio files, and alarm clock function allows you to program the scanner to wake up and start scanning at a specific time each day. A built-in Discriminator Output provides raw discriminator signal to third party signal decoding software without risky hardware modifications. Predefined service search ranges make it easy to find activity in your area. A simplified keypad and display with familiar Scan, Pause, Skip and Navigation controls make it easy for you to use your TRX-1. Behind the scenes, Whistlers exclusive Object Oriented database runs the show, with support for millions of stored objects, limited only by MicroSD card capacity. With the expanded V-Scanner II (VS-II) storage system, you can use the TRX-1 PC Application to save up to 200 V-Scanner configurations on the MicroSD Card, which can be recalled at any time in the field using the radios keypad. Industry standard Composite Device USB interface with USB Mass Storage Device (MSD) and Serial Data (CDC) support. Access the MicroSD card without removing it from the radio, stream decoded Control Channel data and upgrade your radios firmware over USB. 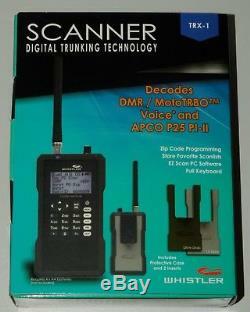 The TRX-1 detects and masks digital voice audio, and decodes RadioID/TalkgroupID data embedded in voice packets. Uses an industry standard MicroSD card to store the RadioReference data library and all of your programming - capacity for millions of stored objects! Supports cards up to 32 GB Scans most common trunked radio system signaling formats, including Motorola, EDACS, LTR and P25 trunked radio networks. Both talkgroup and individual call monitoring are supported. Quickly sweeps the TRX-1's frequency ranges for transmissions from nearby sources. When a nearby transmission is found, the TRX-1 automatically tunes to that frequency and receives the traffic. Lock out found frequencies and continue searching the same band. Monitor storm conditions as they occur, and become aware of dangerous conditions before the media or emergency management officials are able to announce them to the general public. Free downloads of updated database, CPU and DSP firmware. Keep your radios CPU and DSP firmware and RadioReference library current with enhancements and updates as they become available with free upgrades! Programmable tri-color LED displays thousands of colors that can be used to indicate different types of activity or activity on special channels. Program color sequences with multiple colors for special alerts, even emulate the red/blue strobe of police vehicles. Unit Dimensions 5.31" H x 2.12" W x 1.06 L Unit Weight 0.46 lbs. IN THE BOX Digital Handheld Scanner Antenna MicroSD Card Swivel Belt Clip USB Cable Protective Case 2 Inserts User Guide Quick Start Guide. All items carefully packed and will arrive safe and sound. In the rare event of a damaged item please contact me and I will resolve the issue ASAP. The item "Whistler TRX-1 Handheld Digital Scanner Radio BRAND NEW" is in sale since Monday, January 7, 2019. This item is in the category "Consumer Electronics\Radio Communication\Scanners". The seller is "007delorean" and is located in NEW YORK. This item can be shipped to United States, Canada, United Kingdom, Denmark, Romania, Slovakia, Bulgaria, Czech republic, Finland, Hungary, Latvia, Lithuania, Malta, Estonia, Australia, Greece, Portugal, Cyprus, Slovenia, Japan, China, Sweden, South Korea, Indonesia, Taiwan, South africa, Thailand, Belgium, France, Hong Kong, Ireland, Netherlands, Poland, Spain, Italy, Germany, Austria, Bahamas, Israel, Mexico, New Zealand, Philippines, Singapore, Switzerland, Norway, Saudi arabia, United arab emirates, Qatar, Kuwait, Bahrain, Croatia, Brazil, Chile, Colombia, Costa rica, Panama, Trinidad and tobago, Guatemala, Honduras, Jamaica, Viet nam.